Welcome to Hawaii's Plantation Village! Step back in time to when ‘sugar was King’ and experience the real Hawaii. Hawaii’s Plantation Village is the perfect location for keiki, family, and all ages to explore a living history museum and botanical garden. 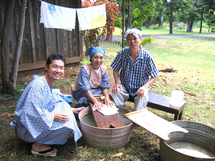 A visit to us opens a door to a time of true hospitality and cultural sharing that sprung from Hawaii’s plantation life. Hawaii's Plantation Village is an outdoor museum telling the story of life on Hawaii's sugar plantations (circa 1850-1950). The Village includes restored buildings and replicas of plantation structures, including houses of various ethnic groups and community buildings such as the plantation store, infirmary, bathhouse and manager's office. We share the story of Hawaii's many cultures: including Hawaiian, Chinese, Japanese, Filipino, Korean, Okinawan, Portuguese and Puerto Rican. Located in historic Waipahu town, our local guides take you on a journey back to the early 1900s where you can experience more than 25 authentic plantation homes and structures featuring personal artifacts, clothing, furniture and art placed in their original settings. Unusual plants brought from China, Portugal, Japan, Puerto Rico, Korea, Okinawa, Polynesia and the Philippines by immigrants from their native lands provide delicious fruit samples during the tour. This “must-see” attraction is located in historic Waipahu town, just down the street from Waikele Shopping Outlets. Hawaii's Plantation Village Crafters make many of the items in our gift shop, which features home-made handicrafts, ethnic music, cookbooks, toys and much more! Guided tours are available upon request and advanced reservation. Japanese speaking guides are available.